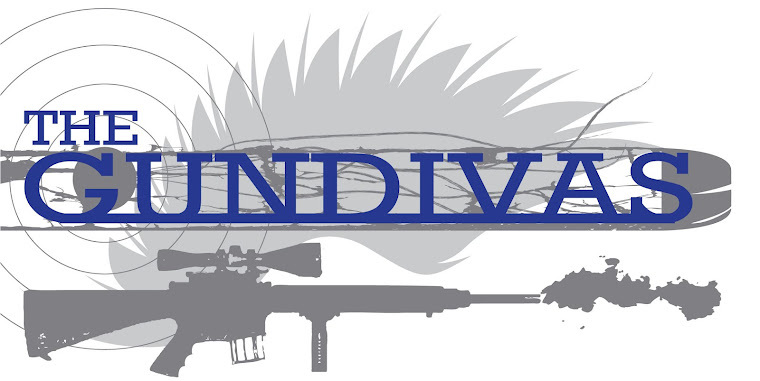 The GunDivas: Momma's Getting A New Gun! Well, a new-to-me gun. The gun itself is about six months old and belongs to my shooting buddy, Mez. He goes through cycles where he stocks up his gun cabinet(s) and then goes through and weeds out some guns, then doesn't like the emptiness of his gun cabinet and buys new guns. You know, like some women and shoes. Only the stuff in his closets is useful. Being a wonderful shooting buddy, he offers me pretty much first dibs on any guns he's thinking of selling. And, boy, oh boy, I wish I'd had the money when he sold his AR-15. But I didn't and it went to a good home, I'm sure. 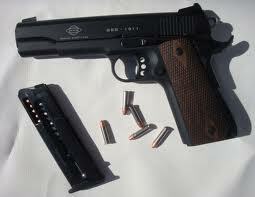 Some of you may be wondering why on earth I would want a 1911 chambered in .22 for Pete's sake? Sounds a little odd, doesn't it? The reason is simple. My Para, though I love her to bits, is expensive to feed. Putting more than a couple of magazines through her is, well, sometimes cost prohibitive. Unless Mez is doing reloading for me, which he does frequently. But that's beside the point. With this little GSG I can practice 'til my little heart's content and not break the bank. I can shoot the Steel Challenges with this gun for $20 instead of $100 (or more) to shoot the Para. I'll still shoot the Para for the Defensive Pistol matches, but will "train" with the GSG. I won't need any new accessories; since it's a 1911, it will fit in my holsters and I can practice my draws while at the range. There are some .22 conversion kits that I could buy for my Para so that I could train with the gun I'm going to shoot, but they're a whole lot more expensive than this GSG (even a brand new one is only around $300) and with the GSG I get a complete gun, not just parts to change out in the Para. I understand the argument about about training with the gun you're going to shoot, and I agree with it. However, training with a similar gun is better than not training at all and with the cost of ammo, similar is going to have to be good enough. I've shot this gun and loved it. It's a great little plinker and just a whole bunch of fun to shoot. I love our .22 pistol! Enjoy using it! Woot woot! It's like Christmas to get a new gun. New toys! PS Did you got to the Shot Show in Vegas this year? Hey - I'd buy too! Like not even think about it - just called up Hubby and say "Babe I'm pulling from the saving account today"